*Special date one week later than normal! – State Committee Members & Delegates elected at the LD Caucus will attend and adopt a new State Party Platform. This entry was posted in Uncategorized on March 27, 2018 by Steve Lydolph. 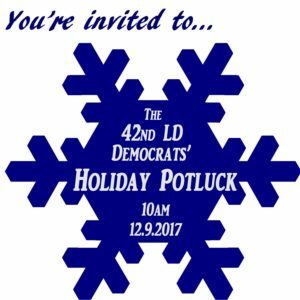 This month, the 42 LD Democrats membership meeting is Saturday, March 10, 2018 at Bellewood Acres, 6140 Guide Meridian from 10AM – 12 PM. This entry was posted in Uncategorized on March 7, 2018 by Steve Lydolph. At the Feb. 10th membership meeting the policy for endorsing candidates and ballot initiative was updated. You can read the updated policy HERE. Or through the link on our Bylaws & Standing Rules page. This entry was posted in Uncategorized on February 25, 2018 by Steve Lydolph. Who serves on the Whatcom Conservation District Board of Supervisor is important. As a citizen your vote is important. An election for one seat on the Whatcom Conservation District Board will be held on Tuesday, March 13, 2018 at the District’s office at 6975 Hannegan Road, Lynden. Polls will be open between 9:00 am and 6:00 pm. All registered voters residing within Whatcom County may vote in person at that date, place, and time or by mail. Mail-in Ballot requests are now closed. Q: I missed the deadline to request a mail-in ballot. What do I do now? Q: I requested a mail-in ballot before the deadline. When are the ballots being mailed out? A: Ballots will be put in the mail on February 13. Q: I requested a mail-in ballot but have not received it? Whatcom Conservation District’s mission is to assist land managers (farmers, land owners) with their conservation choices. This entry was posted in Uncategorized on February 19, 2018 by Steve Lydolph. Join the 42nd LD Democrats for a Holiday Potluck Brunch and Silent Auction! Start your Saturday morning with fresh coffee and holiday cheer – good food and companionship. This entry was posted in Uncategorized on November 29, 2017 by Steve Lydolph. At our October 14th meeting, the membership of the 42nd Legislative District Democrats passed a Resolution Supporting I-940 “De-Escalate Washington. At our November 11 meeting, PCO’s of the 42nd Legislative District Democrats elected Bob Burr to replace Richard Marshall as State Committeeman. Richard had resigned for personal reasons. This entry was posted in Uncategorized on November 26, 2017 by Steve Lydolph. At our September meeting we endorsed: Todd Donovan for Whatcom County Council and Kate Hansen for Ferndale City Council. It was a packed room with over 70 members attending. Here is our complete 2017 General Election endorsement list. This entry was posted in Uncategorized on September 9, 2017 by Steve Lydolph.